While it may not be obvious from the picture, this photo was taken at 3:30AM on a Saturday morning. It was a long day that started at 8:30 AM on Friday and would not end until about 8:30 AM on Saturday. This effort was the culmination of what had already been a week of long days which included working through a holiday weekend. However, our customer needed to have their vibration welding machine completed and on a truck by that Saturday afternoon, and Tony and Paul were among a group of individuals who personally lived our Division’s goal of delivering superior customer service and value. This commitment not only comes from our factory team, it also occurs regularly in our sales team. 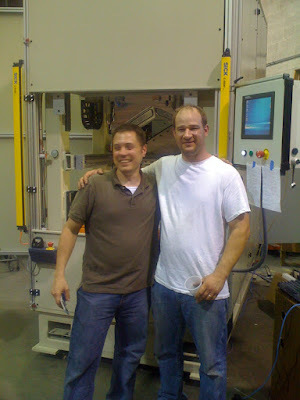 In the same week that Tony and Paul pulled this all-nighter, two of our sales engineers, Ray and Keith, drove a large vibration welding tool down to a customer to get it installed and running before the next morning, when our customer had to be able to show his end-customer that the tool was in place and ready for production. Ray and Keith left our factory at about 5 PM, drove 5 hours, and then helped install and qualify the vibration welding tool. We got a text message from them at 3:45 AM informing us that the tool was in, and qualified. While these examples are the exception, the fact that they happen says a lot about the passion and commitment Dukane has when it comes to providing superior customer service. In both cases, it would have been easy to say, “It’s late, let’s finish this tomorrow”, but in both cases that would have meant that the customer would not have been able to meet their commitments. So, Tony, Paul, Ray and Keith went the extra mile to meet the requirements of our customers. Sometimes that means an all-nighter, but is indicative of the heart and soul of our company.